Click here to apply for this grant! 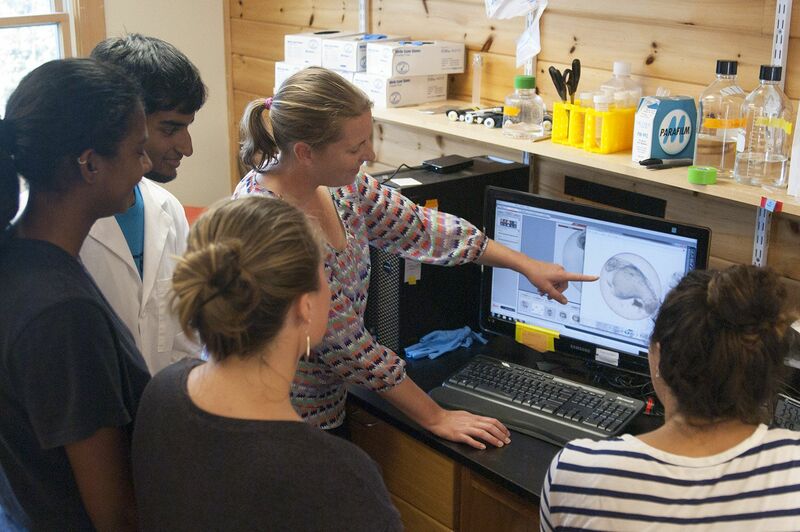 Supported by a major grant from the INBRE (IDeA Networks of Biomedical Research Excellence, an NIH program), the College makes funds available to Faculty and Bates students for the pursuit of research in the sciences. INBRE grants support research in cell and molecular biology, biochemistry, and neuroscience with preference given to projects focused on functional genomics. The project budget is $5,150 for one student to be funded which includes student housing, and up to $2,350 for travel, equipment, and supplies. Faculty/Student Projects may take place for eight to ten weeks during the summer, and must be on a topic that falls within the work of the INBRE consortium: comparative functional genomics, bioinformatic analyses, gene regulation, toxicology, molecular neurobiology, developmental biology and receptor function, biochemistry or geochemistry with a lab or an environmental focus. For an original summer research project designed by a student and supervised by a Faculty member or an outside researcher. The grant ($3,500) includes housing and an additional supplemental amount. The project may take place for eight to ten weeks during the summer, and must be on a topic that falls within the work of the INBRE consortium: comparative functional genomics, bioinformatic analyses, gene regulation, toxicology, molecular neurobiology, developmental biology and receptor function, biochemistry or geochemistry with a lab or an environmental focus. IMPORTANT INFORMATION FOR SUMMER 2019: Faculty who receive INBRE summer grants MUST spend all supply funds by 15 April 2019. 1) Applications for Faculty-Student Research Grants are submitted by the faculty member (project director) to the Dean of the Faculty’s Office. Proposals should not exceed three pages and must include an abstract and a detailed project budget. Please submit electronically by 11:59 pm on 1 February. 2) The Committee on Faculty Scholarship, reviews applications and recommends awards, and funding levels. In granting awards, preference is given to a) applicants who have not received previous INBRE funding; b) non-tenured faculty, or faculty without other means of research support, independent of rank; c) projects designed as preliminary investigations for major grant proposals. 3) In early February, all first-year students, sophomores, and juniors, regardless of conditions of financial aid, are informed of opportunities to work on those faculty research projects for which the faculty member has not already selected a student collaborator. Interested students may apply for a position through the Dean of the Faculty’s Office. Upon receipt of an award, each student is required to meet with the faculty project director to discuss the project, its goals and schedule, before accepting the grant. 1) Faculty members who receive external funds for the same project are usually required to decline their INBRE award. Likewise, students receiving support from other grants will be ineligible for INBRE funding. 2) INBRE Grants are intended to give students an opportunity to engage in long-term, intensive research. INBRE Faculty-Student Research Fellowships typically last eight to ten weeks during the summer and require a significant commitment of the student’s time to the project. 3) Because funds are limited and grants are competitive, the committee may reduce project funding, if such a reduction does not undermine the efficacy of the project. 4) Faculty recipients of the INBRE grants are required to submit written reports within two weeks of the completion of the project to the Dean of the Faculty’s Office. See below for the requirements of reporting. Any future grants are contingent upon these reports. All summer funding is contingent upon a student maintaining a GPA of at least 2.5. Students cannot use research grant funding to participate in a credit-earning summer academic program or receive academic credit for summer research. A significant commitment of time is expected to be successful in accomplishing the goals of the fellowship. Therefore, employment during the period of the project is discouraged..
INBRE Student Research Grant recipients are expected to submit a brief report on their work within two weeks of the completion of the project to the Dean of the Faculty’s Office (see reporting requirements below) and to present their research during the Parents Weekend Poster Session unless they are studying off campus in the fall. Future grants are contingent upon these requirements. More information on the student application process for group and individual student projects is available in the Office of the Dean of the Faculty. In order to assess the value of our summer research programs, make improvements to them and secure further funding to support them, it is critical that the Dean of the Faculty’s Office secure specific feedback on each summer research project from each participant. We excerpt the reports for our own reporting to INBRE. What Do We Need from You? For student-faculty research projects funded through the Dean of the Faculty’s Office, we need a report from both the student researcher(s) and the faculty researcher. In addition, we need an abstract of the work completed. When Do We Need the Information? We need all abstracts and reports submitted within 2 weeks of the completion of the project (i.e., the last day of the student’s contract). We recommend that you spend time during the last week of the project to compile the report. We require timely submission of the reports because of our own reporting requirements. Abstract. The student or students in the research team should prepare a 100- to 150-word abstract summarizing the research question, the methodology, and the results of the research. The abstract must be reviewed by the faculty research director and approved before submission to the Dean of the Faculty’s Office. The faculty should add a statement to the end of the abstract stating his or her approval. Do not use the abstract originally submitted by the faculty researcher in his or her proposal; report on what you actually did. 1) What were the significant findings of the research? 2) Did you actually conduct original research? Do you now know more about your research topic that you knew before? 3) Did your understanding of the material under investigation change as a result of this research experience? 4) How did your summer research experience compare to your previous academic experience in the discipline under study? 5) Are you continuing the research following the summer experience (e.g., thesis, independent study, paid assistantship, following summer)? 1) Was progress made on your research? 2) Please assess the contribution of each student to the project. 3) Do you anticipate that you and/or the student(s) will present the research at a scholarly meeting or publish the work? 4) In assessing student learning in summer research, please comment on the extent to which you think the student(s) might better understand the research questions, the underlying disciplinary principles, the research methodology, critical thinking, and reasoning from evidence. If appropriate, comment on student gains in quantitative literacy as a result of the project. Submission of Approved Abstract and Reports. Please submit the abstract and all reports ELECTRONICALLY by sending Word attachments or pdf files to Alison Keegan (akeegan@bates.edu) in the Dean of the Faculty’s Office. Any future grants are contingent upon these reports.